Back in July, Fox debuted an extended five-minute clip from Family Guy's Season 13 premiere, "The Simpsons Guy", a crossover with the long-running animated hit The Simpsons. With just under three weeks until this one-hour TV event takes place, Fox has debuted new photos from this highly-anticipated episode. The premiere follows the Griffin clan as they somehow get stranded in Springfield, where they eventually encounter The Simpsons. 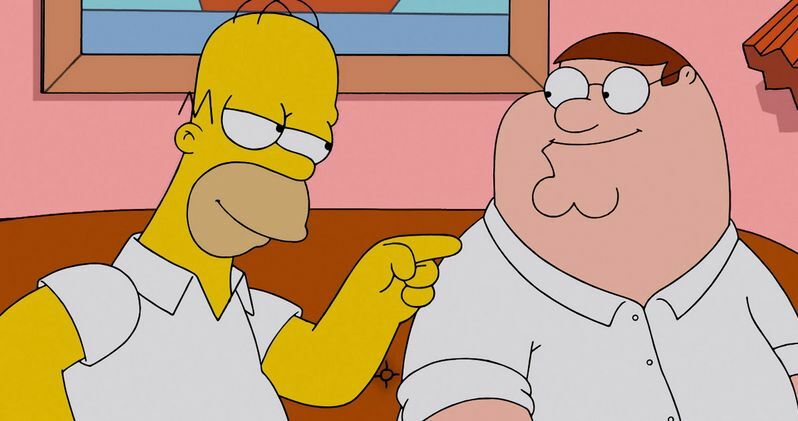 These images show Peter Griffin (voiced by Seth MacFarlane) and Homer Simpson (voiced by Dan Castellaneta) bonding over donuts before getting into a physical altercation. We also see Chris (voiced by Seth Green) trying out a pacifier alongside Maggie, Brian (voiced by Seth MacFarlane) showing contempt for Santa's Little Helper, Lisa (voiced by Yeardley Smith) trying to teach Meg (Mila Kunis) the saxophone and Bart (voiced by Nancy Cartwright) showing Stewie (voiced by Seth MacFarlane) how to skateboard. Check out these images, including a humorous tease of the couch gag, before this episode airs Sunday, September 28 at 9 PM ET on Fox. The Simpsons kick off Season 26 on Sunday, September 28 at 8 PM ET with "Clown in the Dumps", before Family Guy's one-hour premiere "The Simpsons Guy" airs at 9 PM ET on Fox. As we reported last week, The Simpsons will also air a crossover episode with Futurama characters, entitled "Simpsorama", airing Sunday, November 9.